On Friday, Andy and I had the rare treat to go out together, by ourselves. Our travels took us to Dallas, and I managed to talk him into taking me to Laura’s Bistro in Plano. After all, I had been sick on Valentine’s Day (and he was gone on my birthday and Braden had been sick). I don’t think we’d done anything, just the two of us, since before Christmas. Way too long. 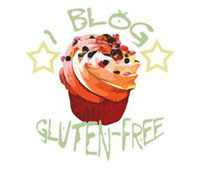 Laura’s Bistro (also known as Delicious N Fit) is an all-gluten-free restaurant, bakery, and store. For those of us with Celiac Disease or Gluten Intolerance, it’s a little slice of heaven. Do you remember going to a restaurant and ordering chicken fried steak and onion rings? I do. It was Friday. I was overly delighted with my Caesar salad with croutons, my chicken fried steak, my roasted garlic whipped potatoes, and a head of perfectly steamed broccoli. Andy thoroughly enjoyed his chicken fried chicken, french fries, and onion rings (and I enjoyed them, too). It was so nice to be able to take bites from his dinner, too. Oh, and Andy bought these cookies. I could only have a nibble (the baby doesn’t like sugar apparently), and was really sad I couldn’t have more. It was 2 chocolate cookies, soft, chewy, and a bit crackly on top, and between them was this wonderful icing. I could not figure out what the flavoring was. But it was like this homemade oreo, only way better than an oreo. The only thing I don’t like about Laura’s, is that it is all the way over in Plano. That means I have to travel home through Dallas traffic (yeah, it only took me two and a half hours). If she can get enough business from non-gf people (because there are a lot more of them than us, lol), then maybe she could afford to open another restaurant in Fort Worth. Laura won the Taste of Plano last year (or the year before, I forget). It wasn’t until after she won that she told everyone that her food was completely gluten-free. So if you’re ever on the Dallas side of life, take time to swing by Laura’s bistro. Have a pizza, a sandwich, some pasta, or some down-home cookin’, followed by a slice of some luscious cake. Maybe even some special cookies are waiting just for you. You DO know that I am totally jealous, right? Sorry I just e-mailed you asking about this place BEFORE I saw this post! Now I can NOT wait to get to Dallas (or Plano actually). Gosh, why the heck have you guys got so many gluten free restaurant in Texas?? I might not want to come back to Atlanta…lol!